Sewing Machine Day is an unofficial holiday celebrated on June 13. It is not clear why this date was selected, because none of the patents for a sewing machine was issued on June 13. However, this fact does not prevent sewing enthusiasts from celebrating. The first sewing machine design was invented by the English inventor Thomas Saint in 1790. However, Saint's machine was not successfully marketed or advertised. It was the French tailor Barthélemy Thimonnier that invented the first practical sewing machine and opened world's first machine-based clothing factory. The first sewing machine in the United States was patented by John Greenough in 1842. 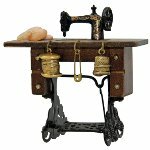 The invention of sewing machine is considered to be an important milestone in the Industrial Revolution. It allowed to decrease the amount of manual sewing work and improve the productivity and efficiency of the clothing industry. Although noways the sewing machine has ceased to be a standard household appliance, its historical significance is undeniable.